Thanksgiving is just about here. Preparations are well underway, everything seems to be in order, except … we forgot about the wine. Whether Thanksgiving, Christmas or any other outsized entertainment situation, it is entirely possible that crucial but peripheral elements to the feast are lost in the organizational shuffle, despite your best efforts at precise planning. As crises go, this is a minor one, easily remedied. Many wine shops are open Thanksgiving morning (perhaps the owners understand how the holiday mind works). And if your particular merchant is taking the day off, supermarkets can do in a pinch, if state liquor laws allow it. The last minute is not the time to agonize over finding specific recommendations, esoteric selections or finely calibrated food-and-wine combinations. It is the moment to make the best of it, while minimizing the distress. Here are some quick possible solutions. When in doubt, Beaujolais. 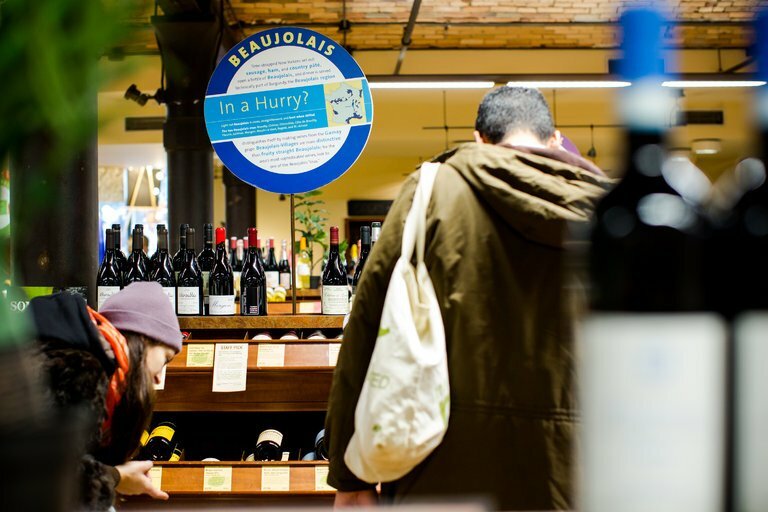 Plenty of wines will go beautifully with your holiday table, but Beaujolais is perhaps the ultimate all-purpose wine. The entire category has gone through a renaissance in the new century. Today you have many excellent bottles in the modest realm of Beaujolais and Beaujolais-Villages as well as in the more exalted crus, the 10 appellations in the hilly northern part of the region that are regarded as capable of making the best wines. I usually gravitate to smaller producers like Jean-Paul Brun, Marcel Lapierre, Julien Sunier, Michel Tête and Dutraive, but on deadline you may not have the luxury to seek them out. Among the bigger brands you are likely to find, I would suggest Louis Jadot and Joseph Drouhin. Whichever you choose, they will cost around $15 to $30 a bottle. The Mâcon is the white equivalent of Beaujolais. You will need to have whites as well as reds. For Thanksgiving, the best last-minute, all-purpose whites are from the Mâconnais region, which, like Beaujolais, is on the periphery of Burgundy. As with Beaujolais, the Mâconnais offers a simple hierarchy, from the modest Mâcon to the slightly more elevated Mâcon-Villages, which might also have the name of a specific village appended, like Mâcon-Lugny, or a combination of villages, like Viré-Clessé, to the top appellations, like St.-Véran or Pouilly-Fuissé. Some top names among small producers include La Soufrandière (and its négociant arm, Bret Brothers), Domaine Cheveau, Les Héritiers du Comte Lafon and Julien Guillot. Among brand names, I would again suggest Jadot and Drouhin along with the Lugny and Viré co-ops. VRAC makes some good wines at very cheap prices. Expect to pay anywhere from $10 to $40. Buy American. Because many people regard Thanksgiving as an all-American holiday (even if Canada celebrates Thanksgiving on the second Monday in October), they prefer to drink only American wines. I’ve never restricted myself that way, but why not? The Finger Lakes region of New York is a source for superb rieslings, and fresh, crunchy cabernet francs. Both would be terrific on the Thanksgiving table. Look for producers like Ravines, Hermann J. Wiemer, Anthony Road and Bloomer Creek, and expect to pay no more than $25. From California, consider Lioco and Sandhi for very good chardonnays and pinot noirs, most under $25. Lioco also makes an excellent California carignan, which would be delicious at Thanksgiving. So does Vesper Vineyards in the San Diego area. Other California labels to look for that provide great value in a range of wines — from cabernet sauvignon and chardonnay to zinfandel, sauvignon blanc and beyond — include Foxglove, Banshee, Broadside, Giornata, Camp and Route Stock. The Whole Shebang makes excellent field blends, mixing multiple vineyards and vintages. And if you can find Matthiasson’s excellent Tendu wines — red and white blends that come in liter bottles closed with crown caps — snap them up. They are the most delicious sorts of wines for a crowd. I’ve called Oregon the most exciting American winemaking area today. While good, inexpensive pinot noir may seem like an oxymoron, Oregon manages to get it done in the Willamette Valley. Look for labels like Montinore Estate, Cooper Mountain and Grochau Cellars. For whites, Eyrie Vineyards makes reasonably priced, superb pinot gris and pinot blanc. Each of these selections should cost less than $25. Bubbles to start. Want some sparkling wines to begin the festivities? If you want to keep with the American theme, Gruet in New Mexico makes good, reasonably priced Champagne-style sparklers for under $20. For around the same price, you can find some very good cavas, light-bodied sparkling wines from Spain. Look for Raventós i Blanc, Dibon, Bohigas, Gramona and Castellroig. Don’t ignore rosé. Would you like to flummox your guests by serving something transgressive? Most people assume that the year’s supply of rosé should have been consumed by Labor Day. Rosé at Thanksgiving would be like wearing white shoes and madras shorts — it’s just not done. Except, rosé would be a superb choice with the feast. Avoid the dusty $8.99 bottles in the window, as they might not have survived the autumn. Bad rosé is not made to last. At $25 and up, good Provençal rosé, whether from Bandol, Cassis or Palette, may cost a little more, but it actually improves with age and will flatter the holiday table. Great beer trumps bad wine. While many wine shops will be open on Thanksgiving morning, it is not a sure thing. If you have to rely on supermarkets, you will most likely be able to find some of the bottles I have mentioned. But beer may be your best option. These days, supermarkets, drugstores and even corner bodegas often carry world-class beers among their selections. Most, I hope, store them well. If you have a choice, pick bottles, or even cans, that have been refrigerated rather than left tepid on the shelves. My colleague Orr Shtuhl recently offered a reasoned approach to selecting beer for Thanksgiving. But you may not have the luxury of time to track down the bottles he is suggesting. In that case, keep it simple. Pilsners and lagers, which tend to be snappier and lower in alcohol, are best earlier in the festivities, with snacks and the business of possibly reacquainting yourself with extended family and friends. For the main event, bring out the darker beers: the brown ales, porters and dry stouts. They, too, will be moderate in alcohol, but their richer, more complex flavors will go well with the turkey and sides. Of course, if preferences dictate otherwise, guests should be free to stick with whatever they like best throughout the meal. No matter how late you shop, finding something good to drink will not be an issue. Just remember to buy plenty of whatever it is you select, because nothing is worse than running out early. Then you have a problem. An earlier version of this article misstated the date Canadians celebrate Thanksgiving. It is the second Monday in October, not the first. Write to Eric Asimov, and follow him on Twitter: @EricAsimov.